Last edited by spaceman5; 7th February 2019 at 04:18 PM. Well, there are a lot of old R2R DACs still selling, for example there are full kits using the AD1865. Chip only, you'll find PCM56/PCM58/PCM1702/PCM1704, AD1860. I can recommend getting either Ians I2S to PCM board or Jlsounds I2SoverUSB interface, both providing the necessary data stream formats required to operate these kind of converters. Can you please tell me which of these DAC Chips sound better? There is no answer to that question because everyone has their own preference. I prefer the TDA1541 to the AD1862 or AD1865 but only just. The I/V conversion used makes more difference as does whether you use non oversampling or not. I prefer NOS, passive I/V and transformer with two 1541A dacs operating in balanced simultaneous configuration. Last edited by batteryman; 7th February 2019 at 08:35 PM. and the last 2 (S1, S2) are the best out of them. Is that correct in your opinion too? If yes, do you know where I can buy a TDA1541A DAC today? I prefer something already built, if possible..
so I will try here, maybe I will have more luck. There is a PC-based sub-forum here on DIYA as well. Mostly deals with soundcards, methinks. Anyway, no multibit is worth the hassle ... even if you like DIY projects. Go with a modern delta-sigma (AKM, TI, etc). They really have exceeded the performance of any multibit ASIC. As far as discrete multibits ... go ahead if you're super bored with plenty o' time to kill. "I got banned from a Hi-Fi forum. And I liked it." Here is a Taobao store with a modular DAC which looks to give many choices of multibit DAC chip. I'm not hereby endorsing the design or the SQ but it looks interesting and its relatively affordable : Arbiter PCM63 I2S 192Khz24Bit?? ?Can communicate in Englis-??? Then if you've no objection to having valves inside, there's the Lite DAC-72 which uses PCM1702, a very well regarded multibit chip (Taobao) : LITE ?? DAC-72 ??? PCM1702 ??*2? ?????-??? Last edited by abraxalito; 8th February 2019 at 03:08 AM. Anyway that's not a price that I would pay for a DAC.. They look nice, but is there maybe a USB Powered DAC product with the above mentioned chips? Something small and similar to the TDA1387: a simple box that has USB input, and 2xRCA output.. Without the mess of supplying wall power..
abraxalito, what do you think about this? Regardingh myself, I should mention that I have no need for hi bitrate or anything like that, what I do need is the sound to be melodic and nice to listen too. 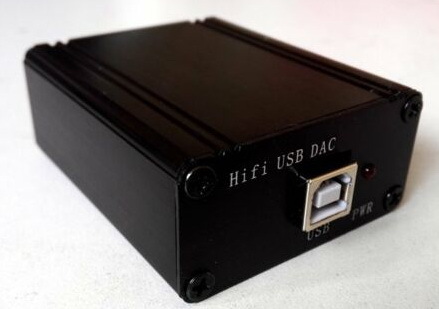 Different DACs simply give a different sound, Some are more enjoying and others are less.. I tested almost 10 different DACs till I found the TDA1387 that I liked. Most of them were Delta-Sigma.. And most of them I did not like..
You didn't specify a price range so I included it anyway. Commercial DACs based on TDA1541A are niche items since the chip's been out of production for so long hence they're going to be boutique-priced. a simple box that has USB input, and 2xRCA output.. Without the mess of supplying wall power.. I'm experimenting on making one based on my PhiDAC board. Won't be as small as that one but should sound better - partly because it has passive filtering and active I/V, partly because its regenerating the USB bus voltage rather than using it directly If you're interested, drop me a PM.